All political leaders face issues and decisions which define their legacy. There are always times when their ability to truly lead are put to the test. Richard Leonard has hardly been in his job of Scottish Leader of the British Labour Party but already his inadequacy for the job is plain for all to see. He is a relatively nice guy, I remember him from Stirling University Labour Club 37 years ago, but being nice is never enough to lead in the rough and tumble of politics. His performances at weekly Question Time debates in the Scottish Parliament have been less than inspiring but his high profile intervention in last week’s Labour Party Conference was not only tactically woeful it was also politically disgraceful. He leads a Party in Scotland battered and bruised by the miscalculations and arrogance of his predecessors who thought they had a divine right to rely on working people to vote Labour in Scotland. The big drift started under the Blair/Brown disaster wrapped up in illegal wars, renouncing of socialism, pathetic PFI/PPP schemes and the removal of free education through the introduction of tuition fees. Many of the most callous welfare attacks were also introduced under the watch of these guys from the early bedroom tax to private sector profit laden assessments of the disabled for benefit payments, Atos. The criminal deregulation of the banking sector and raiding of pension pots were also irresponsible and guided by free market ideology not socialist principles. However the steady loss of support became a tsunami after the incredulous decision to join with the Tories in a unionist pact with the devil labelled ‘Better Together’ but which rapidly degenerated into ‘Bitter Together’ based on promoting fear, lies and distortions to dishonestly frighten enough people in 2014 to reject independence. Labour politicians in Scotland joined with despised Tories to campaign in deprived communities for the continuation of a union which had delivered record unemployment, poverty and the emergence of the ‘working poor’ oxymoron. Thatcher is a bad word in Scotland’s working class housing schemes and villages. That woman waged war on the miners, steel workers, health workers and the very idea of community. She was always rejected in Scotland but hoisted to power on the back of English Tory votes. She punished Scotland for our refusal to back her when she shoved her hated poll tax down our throats 12 months before introducing it in England and Wales. We fought that flagship policy through mass civil disobedience and eventually sank her and her poll tax ship but the legacy of Thatcher lived on. In 2014 Labour embraced the latter-day Thatcherites in a union jack waving exercise which left them in disarray only 8 months later. From 41 of 59 seats won in the 2010 General Election, the Labour Party in Scotland crashed to only 1 seat. They lost all the working class areas they used to consider their own. Those areas which had most enthusiastically backed independence turned their backs on Labour and instead embraced the Scottish National Party. It was an easy leap in many respects. The SNP had long adorned many of the traditional clothes cast aside by Labour. They opposed the illegal war in Iraq. They opposed nuclear weapons. They opposed the Tory inspired Paying For Infinity (PFI) schemes to fund public works. They supported free elderly care. They supported free education. They supported free prescriptions. The SNP was, and is, a left of centre political party. It became the party of the working class in Scotland in 2015. 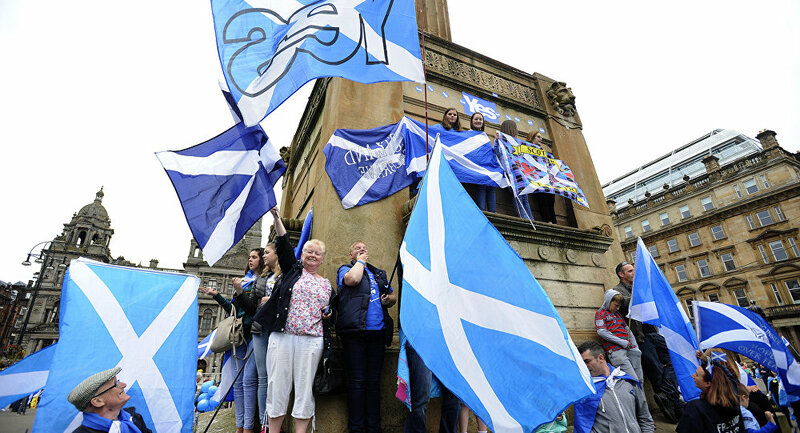 Estimates that at least 30 – 40% of traditional Labour voters supported independence were probably on the low side. The SNP won an amazing 56 of Scotland’s 59 Westminster constituencies and 50% of all the votes cast. Labour in Scotland disintegrated from 42% of votes cast to only 24% and one single seat but they did beat the Tories who only managed 15% of the votes. By the time of the snap General Election last year, much of the pro-Indy fervour had been allowed to wear off as the SNP fought the election with one hand tied behind their backs saying it wasn’t about independence. No wonder almost 500,000 fewer people backed the SNP and voter turnout fell from 71% in 2015 to 66% in 2017. Labour and the Tories, in cahoots with the pro-Establishment and pro-Unionist media, portrayed the 2017 election as a defeat for the SNP yet they clearly won that election with more seats, 35, than all the unionist parties added together. Their percentage of the votes cast fell from 50% to 37% but the Tory vote increased to 28% and embarrassingly for Labour they forced the once rulers of Scotland into 3rd place. So in the last three tests of democratic opinion in Scotland (2015 General Election, 2016 Scottish Election, 2017 General Election) the SNP have clearly won. The Party of Scottish Independence has won the last three democratic elections. So why on earth would Richard Leonard wade in last week with a statement that no matter how Scotland votes in the next General Election he will personally ensure the UK Labour Party manifesto carries a manifesto commitment to rule out IndyRef2? That is an insult to the very voters Labour has to try and win back from the SNP. Many of Corbyn’s policies are very attractive to working class communities. He wants to tackle the wealthy elite and redistribute wealth and power away from the tiny minority towards the vast majority who actually create the wealth in society. As a socialist I applaud that intention and the policies of wealth redistribution, progressive taxation and public ownership. But I believe fundamentally in Scotland’s right to self-determination. I believe Scotland is a country and has the right to make its own decisions and get the government it votes for. Mr Leonard has effectively told me, and thousands like me, that my vote doesn’t count. He doesn’t want it. What a foolish thing to do tactically and what a ridiculous thing to do politically. How dare a Labour leader tell the Scots he doesn’t care how you vote you won’t get another referendum under any circumstance? So if the SNP win the majority of Scotland’s seats next time, for the third time in a row, he will ignore that outcome and declare IndyRef2 out of bounds. It is a pathetic position to adopt and even though Mr Leonard will dismiss my opinion, as he has dismissed the 1.6 million who voted YES in 2014, he will hopefully consider carefully the opinion of an older, wiser, Labour Party member from England, a fellow Yorkshire man just like Richard. England is not a colonial power to the other nations in the United Kingdom and thus each nation within its own assembly has a right if their people choose to hold a referendum to separate from the United Kingdom. There it is in plain English from a Labour Party stalwart and war veteran; “England is not a colonial power” and “each nation within its own assembly has a right if their people choose to hold a referendum to separate from the United Kingdom”. You are absolutely spot on with that opinion Harry, as you are with so many others. Richard Leonard has two choices now. Put his hand in the air and admit he got it wrong and over-stepped the mark and recognise clearly that if the SNP promote independence and win then they have an inalienable democratic right to put that to the Scottish Parliament to decide. Or stick to his indefensible undemocratic position and preside over further decline in electoral support in Scotland. It is up to him but if Labour Party members in Scotland are satisfied with Mr Leonard’s policy pronouncement then they are complicit when the ship sinks even further. Last year across England and Wales the Corbyn effect led to an admirable 10% swing to Labour, the highest since 1945. In Scotland it didn’t even reach 3%. Now even those on the left who mistakenly advocated a Labour vote within the Indy Family will find their position untenable. You simply don’t get independence by voting for a unionist party but now you won’t even get a referendum and that means those of us whole believe in socialism but see independence as a necessary step to achieving it will continue to advocate voting for progressive independence supporting parties not Leonard’s undemocratic option in Scotland. The views and opinions expressed in this column are those of the contributor and do not necessarily reflect those of Sputnik.